Russian Soviet Federated Socialist Republic [Russian: Российская Советская Федеративная Социалистическая республика; Rossiiskaia Sovetskaia Federativnaia Sotsialisticheskaia Respublika, or РСФСР; RSFSR). The largest and most important of the 15 republics constituting the former Union of Soviet Socialist Republics. In the north it bordered on the Arctic Ocean; in the east, on the Pacific Ocean; in the west, on Norway, Finland, the Estonian SSR, the Latvian SSR, the Lithuanian SSR, Poland, and the Belorussian SSR; and in the south, on the Ukrainian SSR, Georgian SSR, Azerbaijani SSR, Kazakh SSR, Mongolia, China, and North Korea. The Ural Mountains mark the conventional boundary between Russia’s European and Asian (Siberian) parts. With an area of 17,075,400 sq km, the RSFSR accounted for 76 percent of all Soviet territory. Because of its vast size and the diversity of its ethnic groups the RSFSR was structured as a federation. It had jurisdiction over 16 autonomous soviet socialist republics, 49 autonomous oblasts, and 6 krais, which themselves contained 5 autonomous oblasts and 10 national okrugs. This division served chiefly to give the appearance of respect for national differences. In 1989 the population of the RSFSR was 147,386,000, a figure making it the fifth most populous state in the world. Russians held a comfortable majority of 82 percent in their own republic. They were concentrated in the European part (especially in the huge central plain around Moscow), the Volga region, southern Siberia, and the Far East. Russians constituted a majority in the Bashkir, Buriat, Kalmyk, Karelian, Komi, Mari, Mordovia, Udmurt, and Yakut autonomous republics and in most autonomous oblasts, and a significant proportion of the population in the other regions of the RSFSR. According to the 1989 census there were 4,364,000 Ukrainians in the RSFSR. The largest and most established concentrations were in the southern regions of the European RSFSR (approximately 170,000 in Krasnodar krai, 157,000 in Rostov oblast, 135,000 in Voronezh oblast, and 185,000 in Moscow oblast); in the southern Urals, (105,000 in the Orenburg oblast); and in several regions of the Asiatic RSFSR (163,000 in Primore krai, 90,000 in Khabarovsk krai). Unlike Russians who lived in Soviet Ukraine, expatriate Ukrainians in the RSFSR did not have their own schools, press, or facilities. Hence, only 43 percent of them had retained the Ukrainian language. In economic terms the RSFSR was the backbone of the Union of Soviet Socialist Republics. It contained three-fifths of the farmland and seven-tenths of the Union’s industry. It accounted for 90 percent of the crude petroleum, 70 percent of the natural gas, 70 percent of the hard coal, 58 percent of the steel, 80 percent of the timber, and 60 percent of the cement output of the USSR; 80 percent of Soviet hard-currency exports came from the RSFSR. In 1989, 74 percent of the RSFSR’s population was urban, compared with 67 percent in Soviet Ukraine. The rate of industrialization, the level of economic development (measured by per capita industrial output), and the average per capita national income were considerably greater in the RSFSR than in other Soviet republics, with the exception of Estonia and Latvia. The average annual growth of national income per person in the 1980s (given a Soviet norm of 100) was 109 in the RSFSR and 96 in Soviet Ukraine, whose per capita output was close to the RSFSR’s. Since the 1980s the RSFSR ‘imported’ more industrial resources, goods, and agricultural products than it ‘exported’ to the other USSR republics. Much of Soviet Ukraine’s agricultural output, coal, iron, and steel was sent to the RSFSR. An important part of the RSFSR’s investment capital was extracted from Soviet Ukraine. According to most criteria the economic development of the RSFSR was higher than that of Soviet Ukraine. But the privileged position of the Russians in the USSR could not be described in economic terms such as these. Although neither the RSFSR nor the Union of Soviet Socialist Republics could be described as a nation-state, they were the creations and political instruments of the Russian nation. The Russians enjoyed a special status within the USSR. Soviet ideology paid tribute to the ‘great Russian people’ as the ‘leading nation,’ with a ‘special historical role’ in the Soviet state. Of the 15 Union republics Russia was the only one to be mentioned in the USSR anthem. Russians were significantly overrepresented in the Soviet power structure. The central institutions and the political hierarchy were dominated by Russians. About 60 percent of the Communist Party of the Soviet Union (CPSU) membership was Russian. In 1986, 85 percent of the 13 CC CPSU secretaries, 83 percent of the 83 USSR ministers, and 88 percent of the 17 top military commanders were Russians. By 1988 the Union leadership and elite had become more Russian than in any other period. In 1982 non-Russians constituted 38 percent of the Politburo; in 1988 they amounted to a mere 15 percent. Similarly, within the CC CPSU and the central Party bureaucracy there was a visible decline in non-Russian representation. The 16-member presidential council appointed in March 1990 included only 5 non-Russians (one Ukrainian among them). Its only non-Communist member was a Russian right-wing nationalist. Furthermore, the Russian republic was not as distinct structurally from the Union of Soviet Socialist Republics as were the other republics. The RSFSR had its own Supreme Soviet and Council of Ministers but did not have a separate capital, KGB branch, television and radio system, or trade-union organization. The RSFSR had no international status: in contrast to the Ukrainian Soviet Socialist Republic and the Belorussian Soviet Socialist Republic it did not even have a seat at the United Nations. 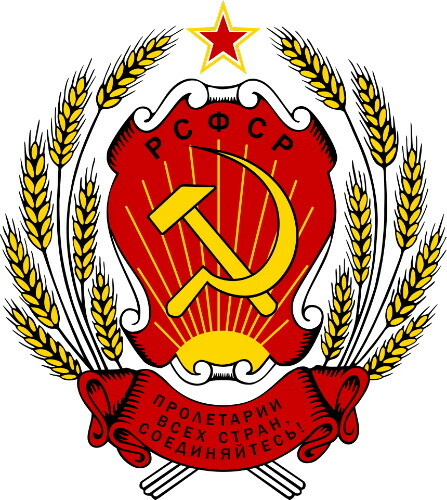 From 1925 the RSFSR did not have its own Party apparatus (with a Congress, Central Committee, Politburo, and Secretariat) distinct from the all-Union structure, as had the other 14 republics, although a special Russian Bureau was set up in the CC CPSU by Nikita Khrushchev and Mikhail Gorbachev. It was only in 1990 that the Russian republic got its own ministry of the interior and academy of sciences (the former USSR academy). History. The RSFSR dates back to 7 November 1917, when the Bolsheviks overthrew the Provisional Government and established the Soviet of People’s Commissars under Vladimir Lenin’s leadership as the new government of the Russian Empire. The Third All-Russian Congress of Soviets (23–31 January 1918) proclaimed the establishment of the RSFSR, and the Fifth All-Russian Congress of Soviets adopted the First Constitution of the RSFSR on 10 July 1918. The most striking feature of the Constitution (and its revisions in 1925, 1937, and 1978) was the absence of provisions for any genuine federation. After conquering non-Russian territories the RSFSR tried to legitimize its dominance over them by proclaiming its laws to be applicable throughout the lands of the old empire and by signing bilateral treaties with the new Soviet republics, set up in the territories. By decree of the All-Russian Central Executive Committee in June 1919 Ukraine’s administration of military, economic, and financial affairs, communications, railways, and labor was merged with Russia’s. In the ‘federation’ treaty of December 1920 all the major government powers were handed over to unified Russian-Ukrainian commissariats and in reality to the RSFSR government. In later ‘federative’ agreements Ukraine consented to have the RSFSR represent it on the international stage. In 1920–1 similar treaties were signed by the RSFSR with other Soviet republics, which were thereby deprived, in effect, of any internal and external independence. This process of absorption of the non-Russian republics by the RSFSR led eventually to the formation of the Union of Soviet Socialist Republics. When the federal state of the Union of Soviet Socialist Republics was created on 31 December 1922, the RSFSR was reduced to the status of a republic within the Union. According to the new constitutional arrangement proposed by Vladimir Lenin, the existing and future Soviet republics did not merge with the RSFSR but joined it in a state of a ‘higher level,’ the USSR. With the dissolution of the USSR in 1991 the RSFSR was renamed the Russian Federated Republic, and then the Russian Federation.